There are a few easily identifiable examples in the video of the world items using physics simulation. When picking up the gold coins how the ones above fall down. Unreal has built in physics simulation and if you setup your game and assets properly you can get the same physics behavior as let's say skyrim or fallout with a few tweaks. I mentioned Single Player physics based item interaction because multiplayer physics replication when dropping the items into the world is out of the scope of the example content. Just to clarify, this is not an RPG Starter Kit or fully working game. Although it does include a lot of examples and is easy to learn from and extend. The examples are meant to teach you how to use it. But please feel free to use the demo examples in your own projects and to expand upon them. Last edited by Pirate; 12-13-2015, 07:02 PM. When can you take my money? I want you to take my money in exchange for this. It would be so awesome if this was released before Christmas break. Fingers crossed! Last edited by Robviously; 12-15-2015, 05:52 PM. I would be so awesome if this was released before Christmas break. Fingers crossed! I'm not sure it will be, still waiting to get a release date from Epic. I believe the wait has been about a month on average from acceptance to posting, maybe a little more. There have been several items that have publicly said they were approved and it's been 4-5 weeks. I'm guessing it will be out in the last half of Jan or early Feb because of the holiday break. If you want to release it before epic approves you you can always try gumroad or sellfy. I know I would like the opportunity to purchase it before christmas so I have some time to break it apart during christmas break. Last edited by axell699; 12-19-2015, 10:32 AM. One question: you say 'create new items easily'. Does your system allow for integration with an existing game item/entity system, or does it provide its own base class that must be used? If the former, how is it integrated? Would I add and configure a component to my existing actors to make them inventory compatible, or something along those lines? I am considering a pre-release version for people who really want it while they work on their projects over the holidays. I'll be making a decision over the next few days. I will be adding a quick video in the next few days showing how in a couple of minutes you can add a new items to the system. This will also give a quick overview of how the items are handled in the system. The items are information stored in a Data Table (makes it easier for editing items and adding database support). The inventory items themselves are structs holding the properties you want items to have. It would be fairly straight forward to swap out the inventory items to a class of your own making. I am planning on doing a tutorial around release on how to use c++ data assets for items and integrate them with the system. To give an actor a inventory you simply pick one of the following two components. Inventory Component: This is a basic inventory with properties and allows the player to loot and/or store items in it depending on it's configuration. Equipment Inventory Component: This component allows the actor to also have equipment and is used with characters you want to be able to equip items. Additionally a Player is also given the Inventory Manager Component which allows the player to interact between his inventory and the inventory of any actors in the world. As an example.. If you wanted to create a storage container that only the player who created it can access. It would be as simple as creating an actor and giving it an inventory component and when it is used you check to see if the player using it was the player who created it. Last edited by Pirate; 01-18-2016, 08:51 PM. I have added a quick tutorial video on adding new items into the inventory system. Last edited by Pirate; 12-26-2015, 11:46 AM. 1) Does your setup override the "Game Mode". 3) What is your target price point? 1. 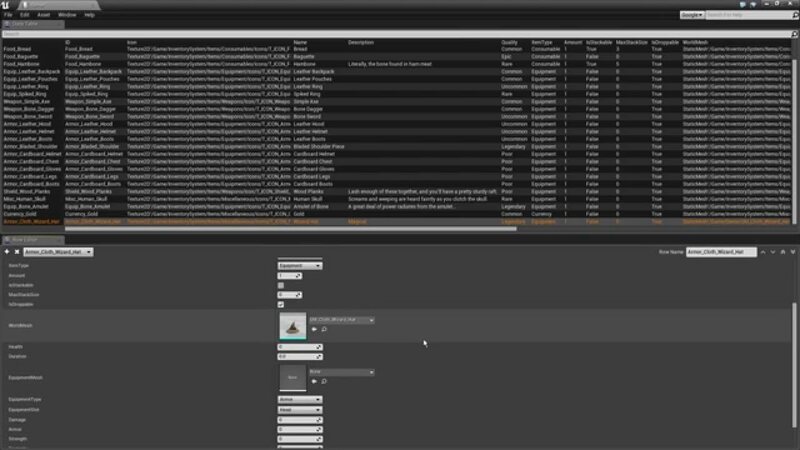 The inventory system itself is plug and play through components that you add to actors/characters. The Demo project does has a HUD, GameMode, etc.. but it is easy to migrate what you want. 2. I would say this is beginner to Intermediate friendly. If you are a beginner and you take the time to understand how the system works it should be pretty straight forward to adapt it to your own projects make changes and add new features. It was designed to be painless to integrate into existing projects but that is assuming some level of knowledge and understanding. 3. It won't be more expensive than any of the current inventory offerings.